Google has long supported efforts to encrypt customer data on the internet, including using HTTPS everywhere. In the enterprise space, we’re pleased to broaden the continuum of encryption options available on Google Cloud Platform (GCP) with Cloud Key Management Service (KMS), now in beta in select countries. Customers in regulated industries, such as financial services and healthcare, value hosted key management services for the ease of use and peace of mind that they provide. Cloud KMS offers a cloud-based root of trust that you can monitor and audit. As an alternative to custom-built or ad-hoc key management systems, which are difficult to scale and maintain, Cloud KMS makes it easy to keep your keys safe. With Cloud KMS, you can manage symmetric encryption keys in a cloud-hosted solution, whether they’re used to protect data stored in GCP or another environment. You can create, use, rotate and destroy keys via our Cloud KMS API, including as part of a secret management or envelope encryption solution. It’s directly integrated with Cloud Identity Access Management and Cloud Audit Logging for greater control over your keys. Forward thinking cloud companies must lead by example and follow best practices. For example, Ravelin, a fraud detection provider, encrypts small secrets, such as configurations and authentication credentials, needed as part of customer transactions, and uses separate keys to ensure that each customer’s data is cryptographically isolated. Ravelin also encrypts secrets used for internal systems and automated processes. At launch, Cloud KMS uses the Advanced Encryption Standard (AES), in Galois/Counter Mode (GCM), the same encryption library used internally at Google to encrypt data in Google Cloud Storage. This AES GCM is implemented in the BoringSSL library that Google maintains, and continually checks for weaknesses using several tools, including tools similar to the recently open-sourced cryptographic test tool Project Wycheproof. 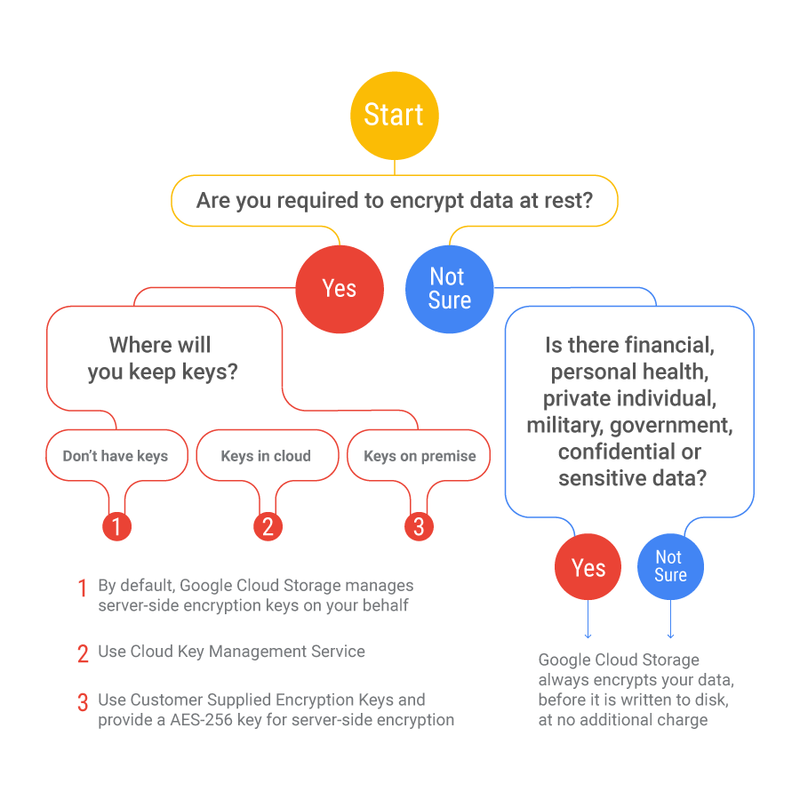 With the introduction of Cloud KMS, GCP now offers a full range of encryption key management options, allowing you to choose the right security solution for your use-case based on the nature of your data (e.g., is there financial, personal health, private individual, military, government, confidential or sensitive data?) and whether you want to store keys in the cloud or on-premise.